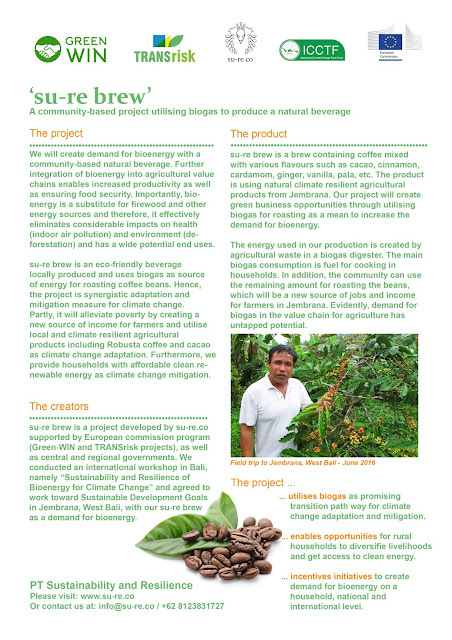 I am please to announce the 1st su-re.co academic journal publication, "Identified vulnerability contexts for a paddy production assessment with climate change in Bali, Indonesia" with Widada Sulistya, Edvin Aldrian, Sheila Dewi Ayu K from Indonesia Met Office www.bmkg.go.id and SEI - Stockholm Environment Institute. We do community-based and policy-oriented actions based on solid scientific research and findings. Please let me know if you are interested in reading this article. Indonesia is one of the countries that is most vulnerable to climate change. As a small Indonesian island, Bali is likely to also be affected by climate change impacts, including rising sea levels, drought, and flooding, which will also impact on its paddy production. This paper shows how the focus area of vulnerability assessments in Bali has been identified, based on multiple assessments including literature reviews, statistical assessment, stakeholder and policy assessment, and interviews with farmers. A project team applied a six-step process to identify issues linked to climate change, the purpose and system of vulnerability assessment, potential risk/harm in context, and potential variables for a further assessment. The team identified paddy production as a significant issue, and the purpose and system was the Presidential Decree No.5 on paddy production. Significant concerns linked to paddy production included droughts, land use change, and potential variables for vulnerability assessment such as water level and the price of rice. This paper suggests how adaptive measures should be implemented to handle paddy production in a changing climate. The results of this paper were used by a vulnerability assessment on rice paddy and climate change [Takama, T., Setyani, P., & Aldrian, E. (2014). 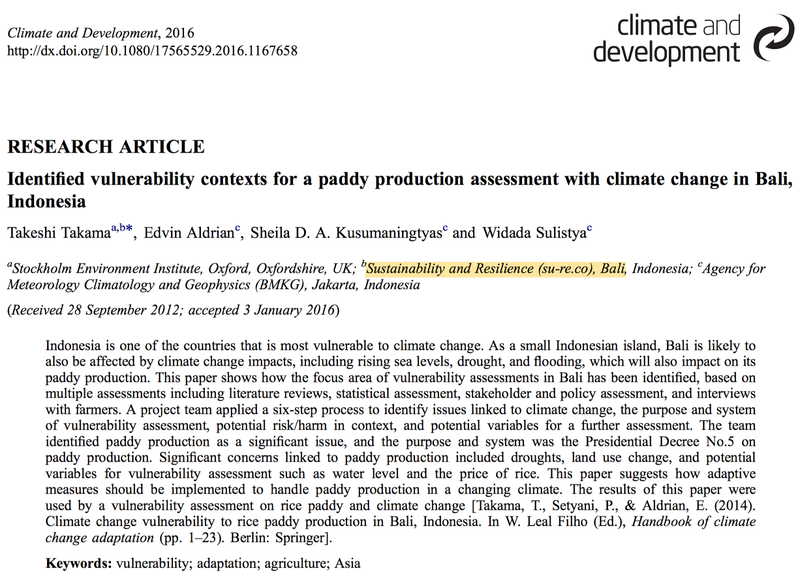 Climate change vulnerability to rice paddy production in Bali, Indonesia. In W. Leal Filho (Ed. ), Handbook of climate change adaptation (pp. 1–23). Berlin: Springer]. 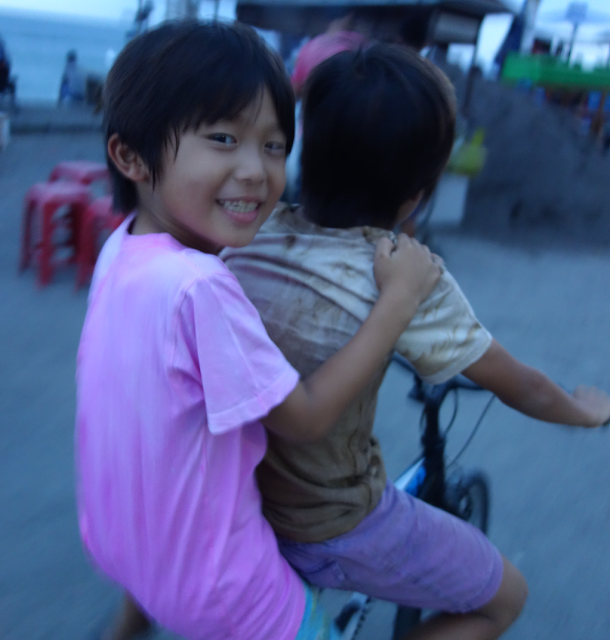 My free-range kids are testing all natural colour T-shits produced by Auditya Sari AKA Su-re.co's ethical fashion promotor. She dyed the T-shirt with coffee and dragonfruit and locked the colours with salt and vinegar. Coffee will be connected to our coffee and bioenergy project! Let's me know if you are interested in this!